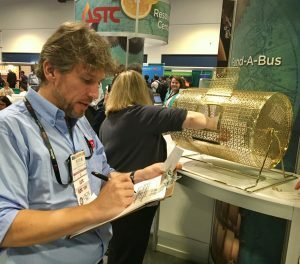 ASTC is pleased to announce the recipients of the Fund-A-Bus minigrants, drawn at random at the ASTC Resource Center in the center of the Annual Conference Exhibit Hall during the 2016 Annual Conference. All awards are contingent on subsequent eligibility review. Fund-A-Bus awards of $1,000 each will be used at these institutions to subsidize transportation costs for children and youth so that they may visit ASTC-member science centers and museums. ASTC-member institutions strive to make their programs open to widely diverse audiences across entire communities, but issues as basic as the cost of transportation can prevent children and youth from enjoying the benefits of exciting and educational science, technology, engineering, and math (STEM) programs. Science centers and museums are invaluable resources to their communities as they strive to be key providers of science education for school field trips and out-of-school programs and camps. The majority of their budgets need to be allocated to essential operating expenses; they do not have additional funds to provide free transportation to the science center or museum for these programs. ASTC members rely on programs like Fund-A-Bus to help bring underresourced children and youth to the science center for innovative, life-changing, hands-on STEM education. Through your generous contribution, ASTC member science centers and museums across the globe will benefit from this program. To learn more about how you can become a Fund-A-Bus sponsor, contact ASTC President and CEO Bud Rock.